A bold, deeply moving, and highly imaginative debut novel about Thomas Jefferson and Sally Hemings, in whose story the conflict between the American ideal of equality and the realities of slavery and racism played out in the most tragic of terms. 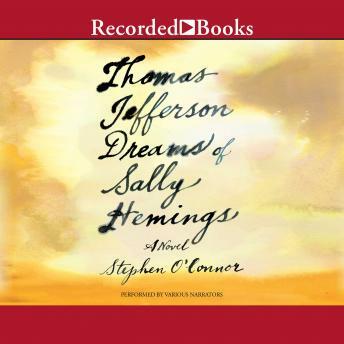 In his vivid, original, and heartrending account of the thirty-seven-year relationship between Thomas Jefferson and Sally Hemings, one which began in Paris in 1789 and ended with Jefferson's death in 1826, Stephen O'Connor manages to be unsparing in his rendition of the hypocrisy of the slaveholder who wrote 'all men are created equal,' and yet to allow both of his protagonists their tender, beautiful, and deeply human moments. This is a novel in which nothing is what it seems, in which innocence shares the heart with evil. O'Connor's tale alternates among lush realism, rendered with a historian's eye for detail, a first person confession penned by Hemings after Jefferson has passed away, and fabulistic interludes in which Jefferson watches a movie about his life. Hemings fabricates an 'invention' that becomes the whole world, and they run into each other 'after an unimaginable length of time' on the New York City subway. Fundamentally, Thomas Jefferson Dreams of Sally Hemings is a story about yearning-for love, for justice, for an ideal world-and about the survival of hope, even in the midst of catastrophe.